It’s been five years since we first hiked to Helen Lake. 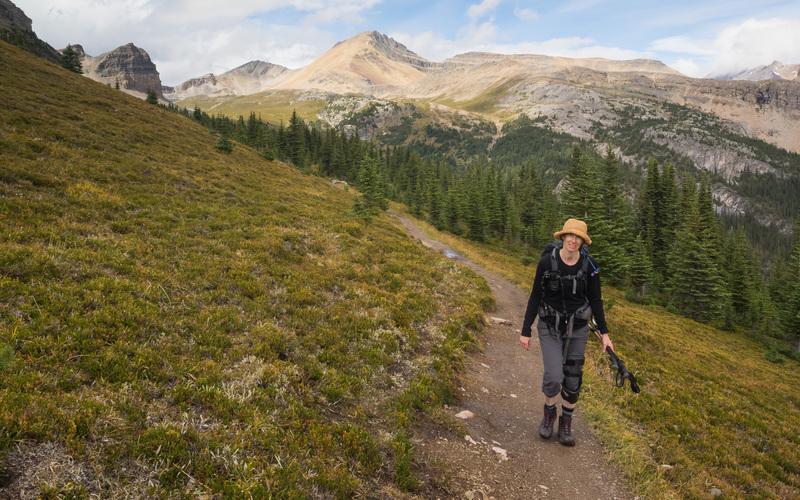 That it’s taken this long to get back to such a highly rated hike that we deemed repeat-worthy first time out is due to a strong preference to explore top-ranked, but new-to-us trails when we’re out and about in the Canadian Rockies. But with Mrs. GeoK in a knee brace (ACL surgery pending), 2016 was our year for repeat hikes. In fact, five out of six hikes we did over the summer months were return visits, selected primarily for minimal scree and steep sections. We headed to Helen Lake the first weekend of September. 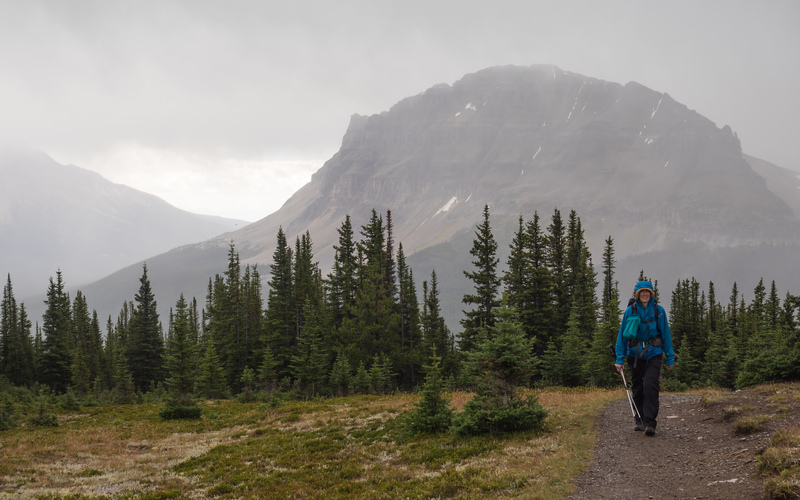 The weather forecast predicted some afternoon showers, so we packed for rain – good thing! It was misting when we pulled into the trailhead parking lot close to 9:30, but within half an hour we’d stopped twice, first to pull on our rain jackets and next to don our rain pants. It rained steadily, at times quite hard, for the next 90 minutes. As we gained elevation, saw could see the snow line at the base of Cirque Peak. Fortunately, the rain eventually tapered off, and finally ended – just in time for up close viewing of a grizzly bear! 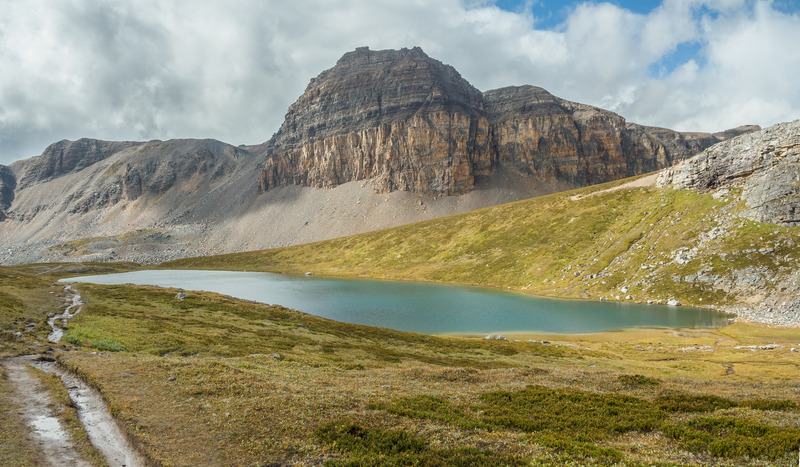 The Helen Lake trailhead parking lot is about 33 km northwest of Lake Louise, along Highway 93 north (aka the Icefield Parkway). As with any hike in Canada’s National Parks, you need to leave a valid park pass on display in your parked vehicle. The good news? 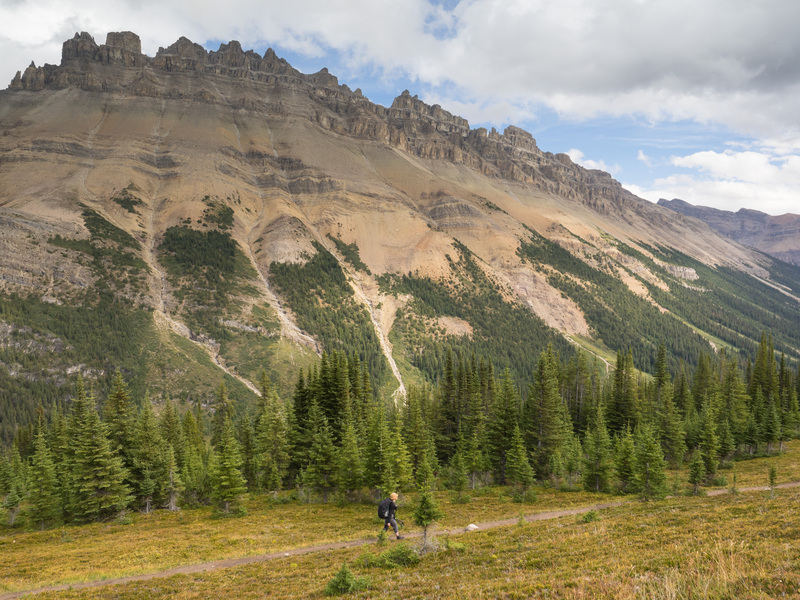 admission to Canada’s National Parks will be free in 2017, as part of our sesquicentennial celebration. The better news? Parks passes purchased in 2016 are valid for 2 full years for the price of one, so you won’t miss out on free admission in 2017. The first 3.5 km (2 miles) is mainly through old growth forest. The trail is quite wide and gains elevation at a steady pace. In a couple of places, switchbacks ease the climb. 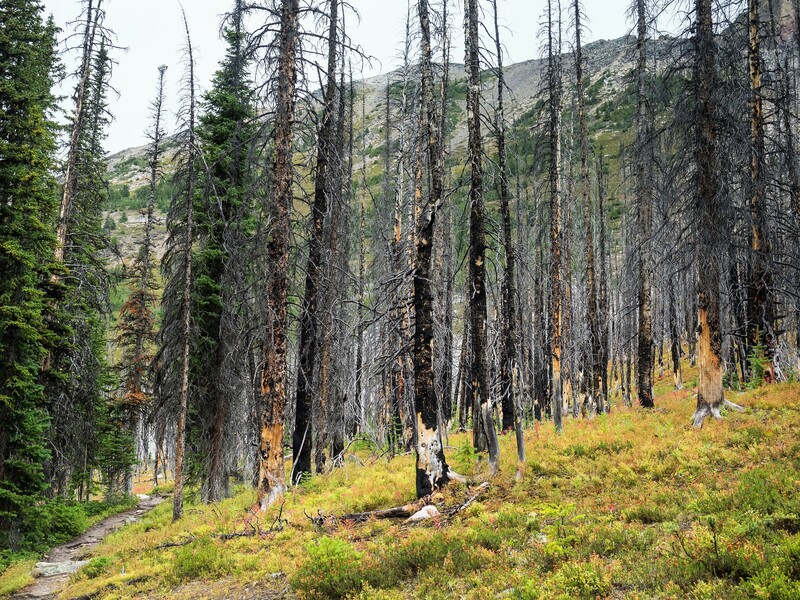 Roughly one hour along the trail (2.5 km/1.5 miles), the trail crosses a small burn area. I haven’t been able to find any information about the fire, but we know it happened more than five years ago because we encountered the same burned out section back in 2011. 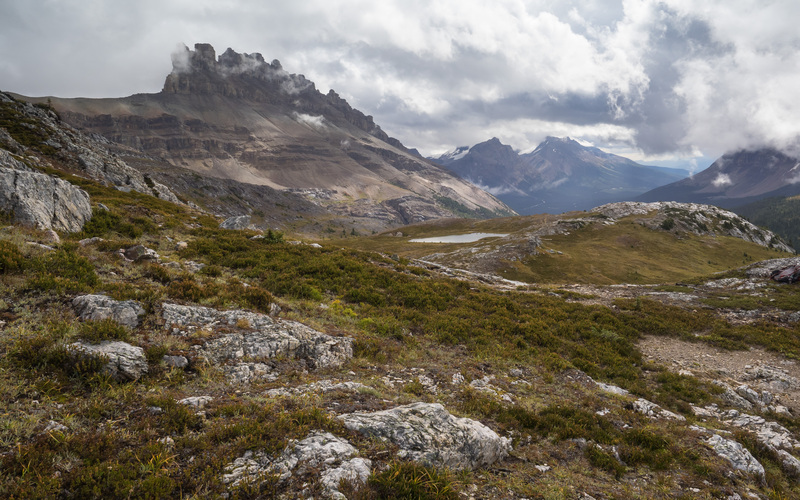 There are a couple of spots just off the trail that offer a pretty good view of the Crowfoot Glacier hanging off Crowfoot Mountain across the valley. 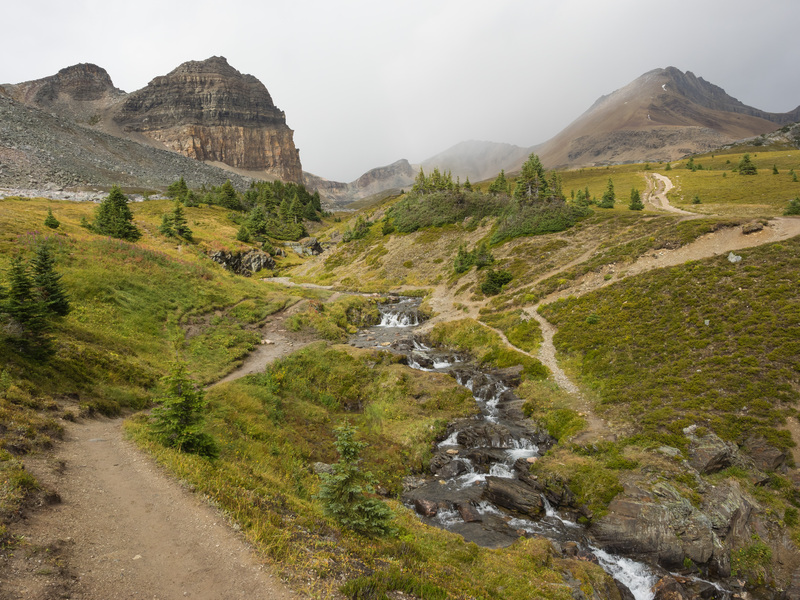 The best viewing spot we found is just before the trail opens up to the lower meadow that parallels Dolomite Peak. About 150 meters past the well-used viewpoint just west of the main trail (left hand side going up), watch for a faint trail off to the south (right hand side going up). 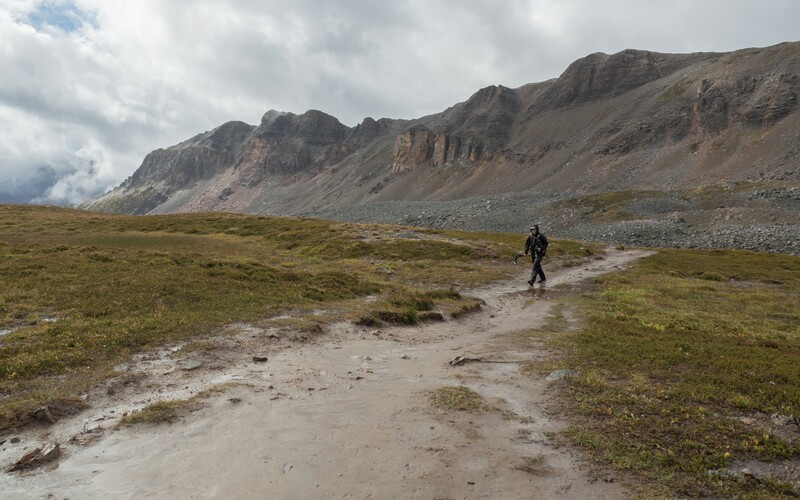 It leads to a nice clearing that offers an unobstructed of both the glacier and Bow Lake (GPS coordinates are N51° 39.84′ W116° 23.99′). About 90 minutes after leaving the parking lot, we emerged from the forest onto a wide bench that runs along west side of the valley. A tremendous range of wildflowers blooms here in the summer. At the beginning of September, there are a few spots of fall colour, but it’s mostly shades of gold. Looking back, Bow Peak is visible directly south and across the valley. The glaciers atop double-peaked Mount Hector can be seen to the southeast. 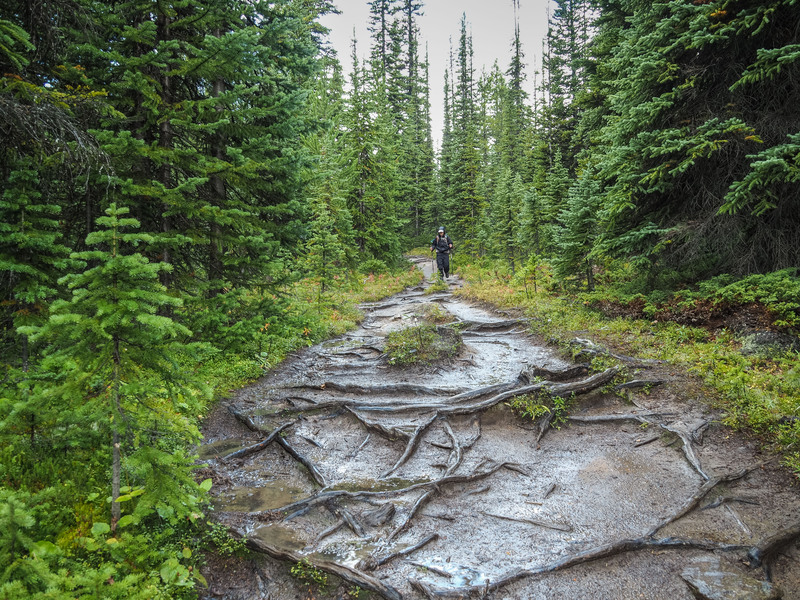 It poured rain the entire 1.5 km (1 mile) stretch to the Helen Lake Creek crossing. 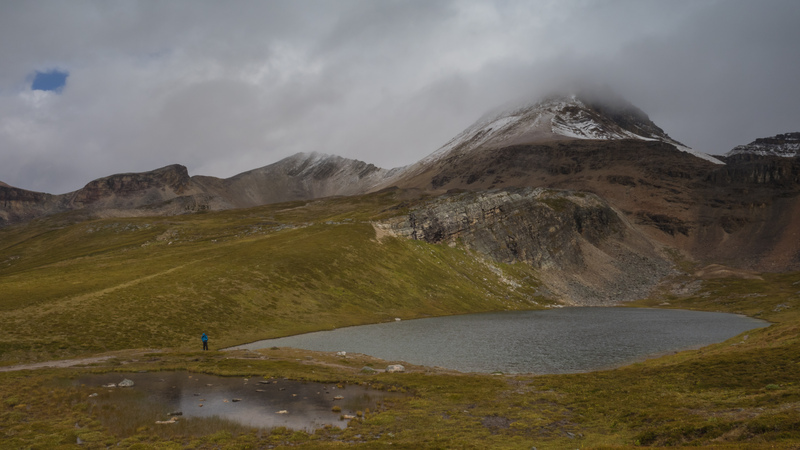 And it kept raining as we walked the remaining 900 meters or so to the shore of Helen Lake. In fact, there was so much rain coming down, that the trail was running with water. As we neared Helen Lake, we noticed that Cirque Peak, or original objective for the day, was sporting a fresh dusting of snow. We were glad the rain was starting to let up as we arrived at Helen Lake. As we chatted with 3 hikers who arrived just ahead of us, another couple arrived. It was time for lunch. Given the fresh snow and my torn ACL, Mr. GeoK and I decided to hang around Helen Lake for a mini photo session and then turn back. Mr. GeoK ascended a small knoll just off the south end of Helen Lake. Meanwhile, I hiked to the head of the lake with the larger group. 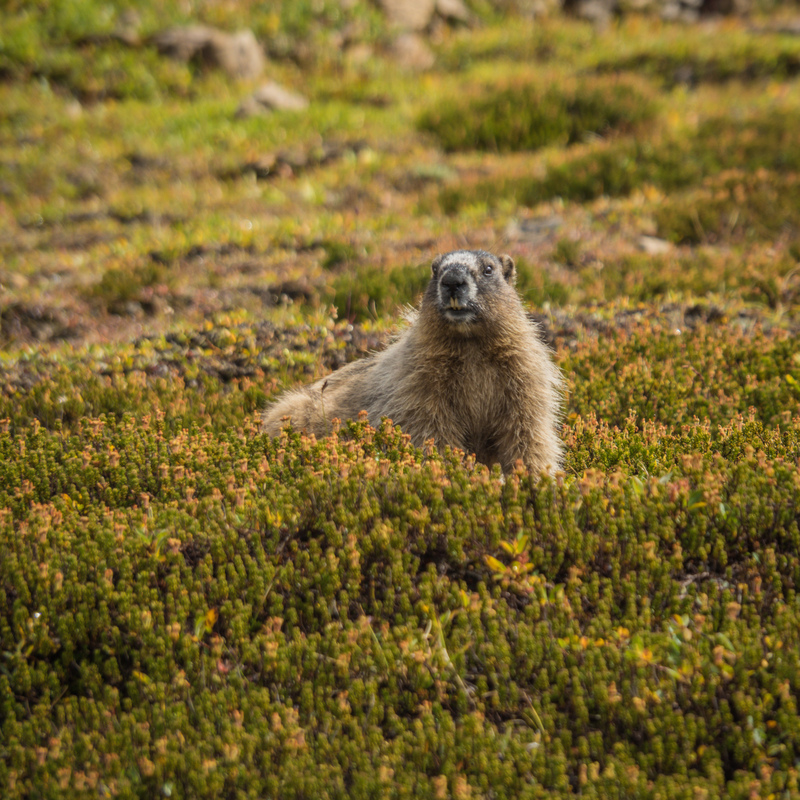 After we all admired a fat marmot enjoying its lunch, the rest of them carried on up the steep switchback to ascend Cirque Peak while I turned back to rejoin Mr. GeoK. Just after I turned back, I called Mr. GeoK on my walkie. No answer. I couldn’t see him, but I did spot movement. 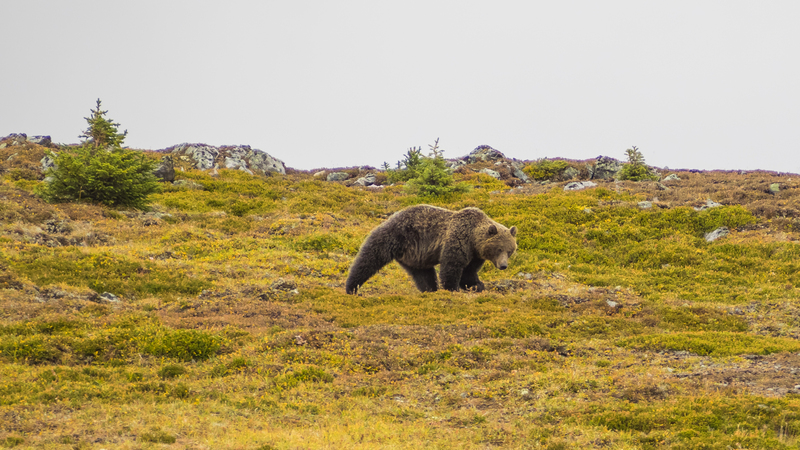 It was a grizzly, on the move – and fast! Right about then I heard shouts of “Bear! Bear” from the group heading up to Cirque Peak. I waved that I heard them, pulled my bear spray out of its holster and tried Mr. GeoK on the walkie again. Still no answer. So I started my usual “Yo, bear” shout that I do as good practice when hiking. It was a lot louder than usual, since I wasn’t quite sure where Mr. GeoK was, but I did know the bear was between me and him. Seconds later, he reappeared at the top of the knoll and waved his acknowledgement. As I walked slowly down the trail regularly yelling “Yo, bear….hey bear”, I lost sight of the grizzly for a couple of minutes. Then it reappeared, circling around behind Mr. GeoK. I used the walkie to tell him to move it down the hill to join me on the trail. 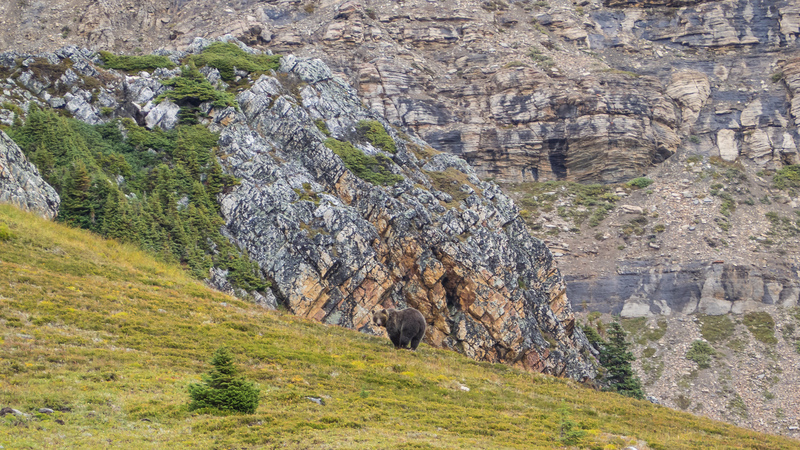 He had his camera in one hand and his bear spray in the other. I breathed a little easier once we were reunited. We kept up the noise as we headed down from Helen Lake, rounding the base of the knoll. That’s when we spotted the same grizzly again. It was obviously hungry and we spent the next 10 minutes or so watching that bear dig a huge hole to get at something tasty. It completely ignored us, standing off in the distance, so I also shot some video. One clip is posted here on Facebook. After all that excitement, we paused long enough at the Helen Creek crossing to make a few photographs of the cascading waterfalls and to remove and stow our rain gear. We also warned a couple of small groups about the grizzly as they crossed the creek in the other direction. We were pleased to get confirmation that at least one person in each group was carrying bear spray. While photographing the waterfalls, we noticed another small group in the meadow just upstream of the creek crossing. They seemed to be carrying long metal tubes and we wondered what they were up to. 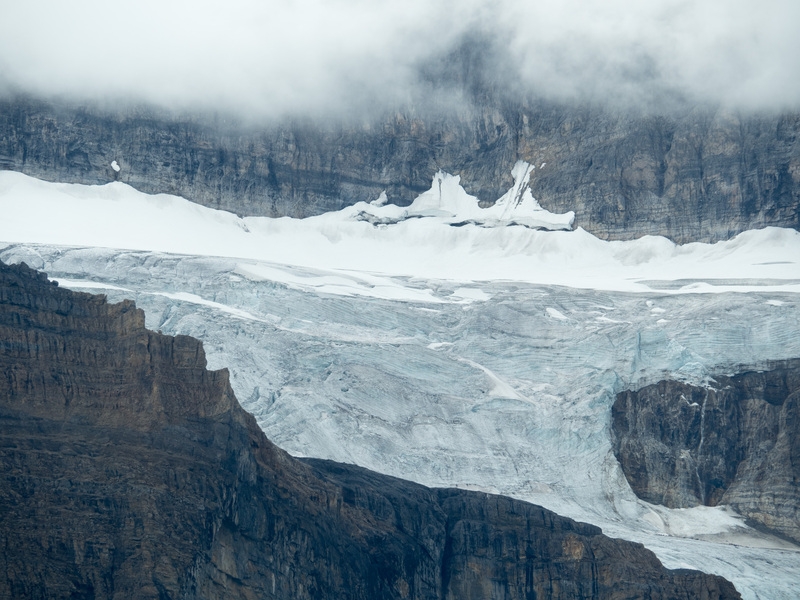 As it turned out, it was a U of C masters student and some of his friends and they were dismantling a temporary weather station that was put in place to record various aspects of the microclimate created by the rock glacier that runs all the way along the west side of the valley. 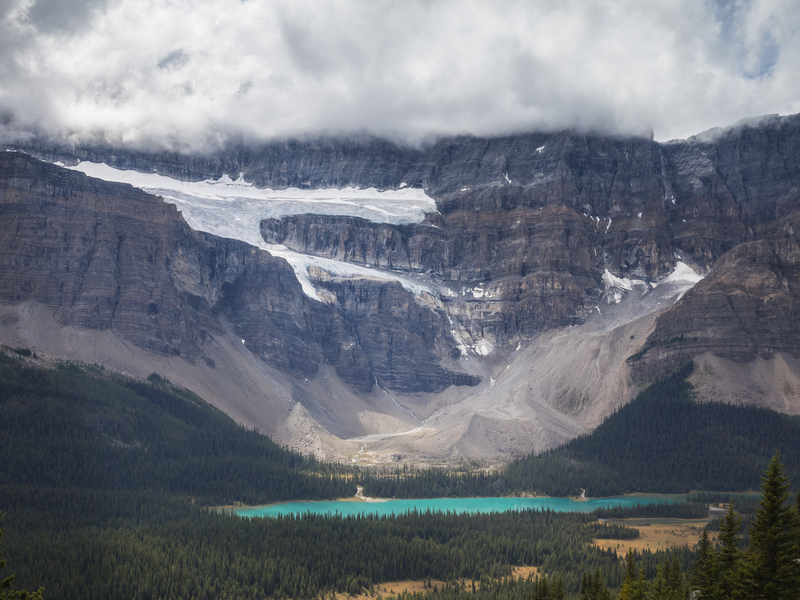 To learn more, check out some of the research projects and papers coming from the Dr. Masaki Hayashi, Canada Research Chair in Physical Hydrology, Department of Geoscience at the University of Calgary. The rest of the hike down was quite lovely. 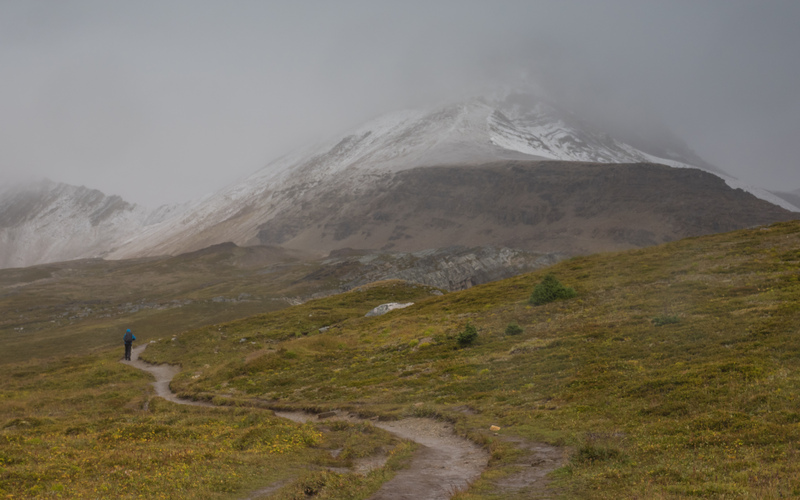 We especially enjoyed the views of Dolomite Peak, which were obscured by cloud earlier in the day. It was a scenic end to one of the most exciting hikes we’ve ever done! We have done that hike once. Didn’t have a great story to go along with it though. It was just a beautiful hike.